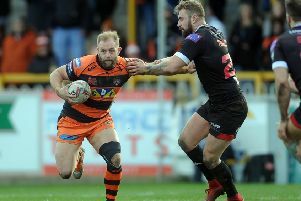 Castleford Tigers are set to be boosted by the return of both their senior half-backs as well as Adam Milner for Saturday’s home game with Challenge Cup winners Catalans Dragons. Head coach Daryl Powell has revealed that reigning Man of Steel Luke Gale will start against the French side so long as he comes through the week’s training while Ben Roberts is also likely to be in the squad, but the Tigers boss has not decided yet whether he will feature in the starting line-up. Both have been absent long term with injuries, but their return is timely to take some of the workload off teenage half-back Jake Trueman and to give Powell a selection headache of the right kind. He told the Express: ”It’s been a tough year in terms of injuries and quite a few of our high quality players have been missing for parts of the season so it’s a great time to have some selection headaches, absolutely. “That always drives players’ standards and team performance standards as a result of that. “I’ve got some decisions to make and I’ll be pretty happy to be making them. “We’ll have Ben Roberts and Luke Gale available this week and I’ll make a decision as we roll through the week on who starts. “Hopefully they get through the rest of training fit and healthy and then we’ll have some more competition for places. “Galey if he’s fit will start and I’ll make a decision on where Ben fits into the whole thing. Loose forward Milner is also set to return after missing the Warrington game when still suffering the after effects of concussion from the previous game. Peter Mata’utia was taken off as a precaution after picking up a small hamstring injury in the Warrington game, but he is in full training and will start at full-back. Powell explained: “Adam Milner will be available and it will be good to have him back, he’s a good quality player. “We want to have as many of our better players available as we can. It will put pressure on performance and it’s great to have a deeper squad to pick from as we move into the last five games. “There’s a lot of real quality in there and I’m getting pretty excited about what we can do at the end of this season. “Peter Mata’utia is fine. He will stay at full-back. Powell has worked the players hard since the last game, using the week without a match to get in some serious practice. He added: “We trained hard last week. We had two really tough sessions, which will stand us in good stead. “The players are looking good, looking sharp and are ready to go. It’s an important game on Saturday against Catalans and we need to play well.